Tsentry Control Platform – TelePro, Inc. 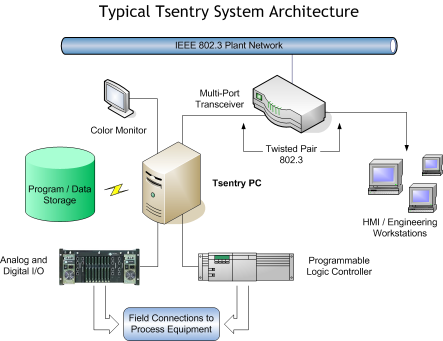 The Tsentry system is a general-purpose, stand-alone process control system platform based on the Microsoft Windows operating system. It utilizes industry-standard hardware architecture, system software, program development facilities, human-machine interface facilities, and communications protocols. This reduces the cost and complexity of expanding and upgrading the system as necessary to keep abreast of rapidly-changing computing technology. Human-machine interface (HMI) displays are implemented as user-developed forms hosted inside Tsentry's .NET-based forms browser application. The standard Tsentry product includes all facilities required to develop and support a human-machine interface system, including custom controls for building animated displays in Microsoft Visual Studio that can access any variable in Tsentry's global common. Any network-connected Windows PC workstation can be used as an HMI client without any additional licensing costs. Tsentry can also be configured to support a variety of other 3rd-party HMI systems such as FactoryTalk, Citect, iFix, etc. The Tsentry host computer is an off-the-shelf PC running the Windows server or desktop operating system (e.g. Windows Server 2016 or Windows 10) and optionally IntervalZero RTX real time extensions. All hardware employs industry-standard, open-architecture systems commercially available from multiple equipment suppliers. Communication is via industry-standard TCP/IP protocol over ETHERNET. The host system is a standard IBM-compatible personal computer and can be configured according to customer requirements. Though it is not required, this can include mirrored disk configurations, PC server architectures, and alternative PC form factors. Prior to commissioning, performance tests are conducted on all systems for extended periods of time to assure reliability. Graphical HMI/Engineering workstation displays are implemented as .NET Forms applications allowing display on any network-connected workstation and are developed using Visual Studio. A fully-redundant backup/development CPU can be included in the architecture, but is not required. If the backup CPU is available, switchover from the primary CPU to the backup consists of simply re-assigning network addresses and moving local I/O cables. In most cases, the switchover can be performed manually in less than 15 minutes. If no physical cables must be moved, application-specific software can be used to perform the switchover automatically. This system interfaces to several varieties of commercially available process I/O hardware. In a typical configuration, the Tsentry host computer is interfaced to PLC I/O hardware via a high-speed ETHERNET link available commercially from the I/O equipment manufacturer. Device driver software already in wide commercial use is supplied to manage the data exchange. Connection to external file servers, scheduling systems, etc. Custom controls for building animated displays. Automatic communications client object for accessing global shared memory variables over the TCP/IP network. Automated processes for publishing screens to client workstations. Any network-connected Windows workstation and proper security credentials can be used as an HMI client. Examples of HMI displays for various process control applications are shown in Figures 2 through 7. Figure 2 is a rolling mill operator's display, showing target and actual measured exit stress distributions, work roll zone spray flow levels, entry and exit thickness deviation trend plots, roll bending and HGC tilt feedback, separating force, mill speed, and other process variables. This display is updated once per second. Data for the trend plots is sampled every 20 milliseconds. Examples of maintenance support displays for rolling mill control functions are shown in Figures 3 through 5. Figure 3 is the work roll bending controller component of an automatic sheet flatness control (AFC) system for a cold rolling mill. Figure 4 shows internal detail for the feedback automatic gauge control (AGC) function on a rolling mill. Figure 5 shows the feedback AGC activation logic. 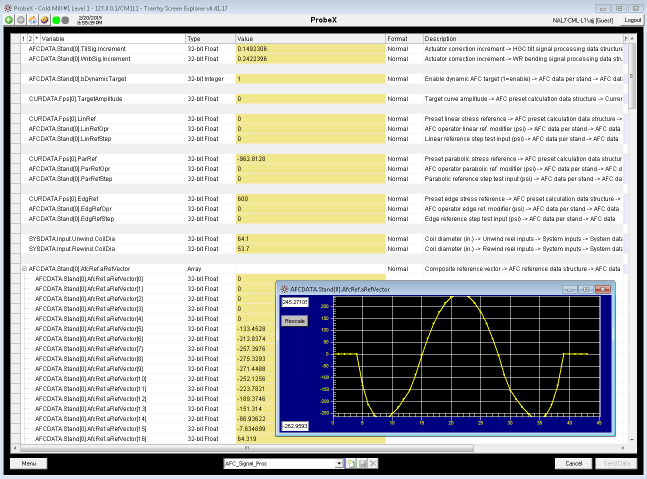 Clicking on the box marked "PID Control" displays additional levels of algorithm detail. Figures 6 and 7 are displays from a real-time thickness and flatness performance data collection system for rolling mills. Figure 6 shows two thickness deviation power spectrum "waterfall" plots in which all of the power spectra calculated during the rolling of a single coil are stacked one behind the other to produce a 3D plot. Figure 7 shows a 3D surface plot representing sheet flatness through an entire coil. The beginning of the coil is at the left of the plot. For debugging code for which a custom HMI control screen has not been created there is a global common variable viewer screen called ProbeX. This allows the user to display and modify any process variable in shared memory by name. Data write access can be password protected. An example of this screen is shown in Figure 8 below. The Tsentry computing platform provides a real-time / historical data trend facility which supports Internet web page based editing and display of process variables. Data may be displayed and edited from a browser run on the system console or on any network-connected Windows workstation. Both graphical and tabular data displays are provided. 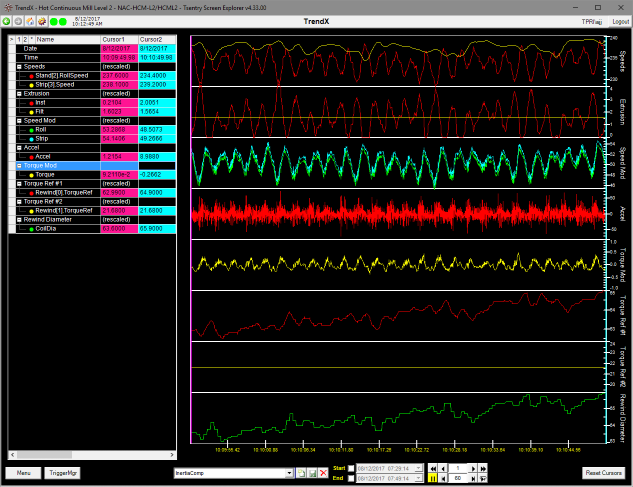 Real-time trend data acquisition. Data is acquired at a 20-millisecond rate (50 samples per second per point) and made available for display on networked HMI / maintenance support workstations. An example of this TrendX screen is shown in Figure 9 below. Tsentry provides all computing facilities necessary to develop, deploy and support real-time applications with program repetition rates as fast as 1 millisecond. This includes the associated HMI displays implemented as a .NET forms application. These facilities are summarized in the following sections. Additional detail is provided in the on-line Tsentry documentation at http://www.tsentry.com. Application name of the process. Name of the binary executable file for the process. A flag indicating if the process uses the Tsentry process management library. Initial delay (milliseconds) before first execution. The process timer interval in milliseconds. The process run mode (standard Win32 or RTSS real-time). A flag indicating whether the process is to be automatically restarted if it terminates. A flag indicating whether the process is to be locked in memory. Flags specifying how process exceptions should be handled. Delay time (milliseconds) before starting the process. Delay time (milliseconds) to wait before proceeding to the next process in the list. Delay time (milliseconds) to wait for deactivation before forcing the process to terminate. The process stall timeout limit (milliseconds). The command tail passed to the process. Data dictionary definition file - Contains the definition of global shared memory. Data dictionary variable initialization file - Defines the global common structure and global shared variable attributes: minimum value, maximum value, initial value, text description, and whether the value is saved to disk on shutdown and restored on startup. LogMsg initialization file - Initializes the message logging subsystem. Allocates a global shared memory region for the data dictionary. Copies the data dictionary definition from file to memory. Allocates global shared memory regions for the applications. Initializes/restores the contents of global shared memory regions. Starts and monitors all process tasks. Displays the status of all system processes on the Tsentry console. Displays the most recent contents of the message logging queue. Starts/Resumes/Suspends/Stops/Configures processes via a console window. Shuts the processes down when requested. Saves the contents of global shared memory regions to disk on shutdown. De-allocates global shared memory regions. The GsmPifBld process builds the data dictionary file used by the NtRtMgr system management process to allocate global shared memory regions. It parses the C/C++ global common header files. These files are created as part of the application software to define variables and structures residing in global shared memory. It then generates the data dictionary definition file. This flat ASCII file contains the definition of global shared memory in the format required for NtRtMgr. Therefore, the global shared memory data dictionary is automatically built directly from the application code. This significantly simplifies the task of managing global shared memory. Names of variables and data structures in each global shared region. Byte offsets of variables and structures within each global shared region. Variable type, size, and array dimensions. Get/set the current value for a variable. Get/set the minimum value for a variable. Get/set the maximum value for a variable. Get/set the initial value for a variable. Get/set the text description for a variable. Get/set the default format specification for a variable. Get the data type for a variable. Get the size of a variable. Get the array dimensions of a variable. Get the global shared region offset for a variable. The Tsentry web-based HMI system includes components that also use data dictionary functions to access global variables by name. These components display text values and graphical objects that change size, shape, and color based on global common variable values referenced through the data dictionary. Tsentry system facilities that initialize the contents of global shared regions, restore global data from disk files on system startup, and save global data to files on system shutdown also use the Data Dictionary support library. The Data Dictionary is normally built as a standard part of the application build procedure. The tpriNtRtAdmin application is used offline for creating empty real-time process shells based on standard templates. This task generation procedure results in the creation of three new files: a Visual Studio C++ project file (newtask.dsp or newtask.vcproj), a C++ source file (newtask.cpp), and a C++ header file (newtask.h). By default, all of these files are copied to a new directory with the same name as the new task. Application-specific code is added to each of these sections of the template to complete process development. There is also an option to generate a task that uses managed extensions. This flag creates a task that is compatible with the Common Language Runtime and .NET Framework libraries. A managed extensions task also generates a fourth source file mytaskAssemblyInfo.cpp, which provides information for the generated assembly. The GsmOpcSvr process is an OPC (OLE for Process Control) server for Tsentry global shared memory. It accepts requests for named variables in global shared memory from any OPC client on the TCP/IP network and returns the current value of the variable to the client. Then, as the value in global shared memory changes, the server pushes the new value out to the client. The server also allows clients to write the values of these variables back into global shared memory. The OPC server provides network access to variables in global shared memory and is the basis for the Tsentry HMI system. The TPRI.OpcMgr object is an OPC client responsible for automating all active variables on a Tsentry Visual Basic HMI display. On initialization it searches for any objects on the screen that access global shared variables on the Tsentry host. It then requests updates for these variables by name from the host. Then, as these variables are updated by the OPC server on the host, the OpcMgr object passes these updates back to each of the requesting screen objects. In the Tsentry environment, standard Windows functionality remains intact. This includes the file system, networking facilities, and the standard Windows process scheduling system. The IntervalZero RTX real-time extensions provide true deterministic process scheduling under Windows. A Windows process is an independently executing instance of an application/program. A thread is an independent execution path within a process. Each process has at least one thread, the primary thread, and may start other threads to handle additional functions. Each of these threads is scheduled for execution independently of the others. The standard Windows operating system supports 32 priority levels for scheduling threads within a process. These Win32 priorities are numbered 0 (lowest) through 31 (highest). Whenever the dispatcher reschedules a processor, it finds the highest priority thread available and assigns the processor to execute that thread. The 32 standard Windows priority levels are further divided into two groups or classes: 'Win32 Normal' and 'Win32 Real-Time'. Once a process is started as Normal (sometimes called the Dynamic or Variable-Priority) or Real-Time, all threads of that process have priorities reserved for the same type of process. The priority of a thread of a 'Win32 Normal' process ranges from priority level 0 through 15. 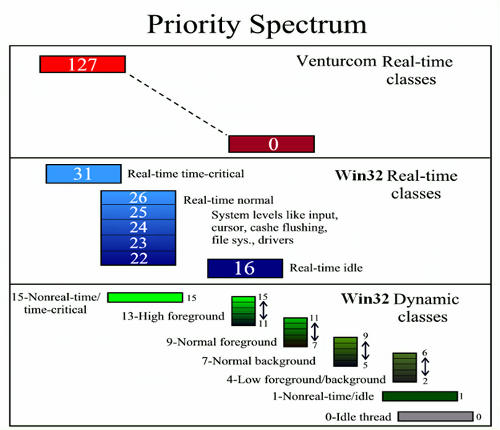 The 'Win32 Real-Time' priority range includes priority levels 16 through 31. Thus, all threads within a 'Win32 Real-Time' process are scheduled for execution before any of the 'Win32 Normal' threads. Each standard Win32 process is assigned a 'base priority' when it is started and each of its threads is assigned a current priority derived from the priority class of the process. The Windows operating system scheduler automatically adjusts the priorities of threads within the 'Win32 Normal' (or Variable-Priority) class in order to optimize system response time. CPU bound threads tend to have their priorities reduced while threads ending a wait (for a resource, time interval, etc.) have their priorities raised. In general, Win32 real-time processes have priority over most other activities and system events. However, for processes in the spectrum of dynamic classes at lower priority levels, a number of system events, such as I/O completion, can cause temporary priority changes for a thread. The Windows scheduler is a pre-emptive scheduler, meaning that it attempts to execute the thread with the highest priority at any instant in time. As a result, a Win32 thread can be forced to relinquish the CPU by the operating system if a higher priority thread requires the processor. calls function 'Sleep' with an argument of 0. RTSS threads run at one of 128 distinct "hard real-time" priority levels and compete for CPU time using only that priority. Threads execute in priority order and in "first in, first out" order within any single priority level. Threads are not subject to time-sliced sharing of a processor; that is, an executing thread runs until it gives up the CPU, or until an external event readies a higher priority thread. RTSS scheduling uses a priority promotion protocol to eliminate unbounded priority inversion. Standard Windows system operation remains intact. Provides a simple library of real-time extensions for standard Windows. Priority levels 0 through 15. Priority can be altered by the operating system to optimize system response time. Priority levels 16 through 31. Generally have priority over most system events. Can be forced to relinquish CPU before completing. Best for lower-speed process repetition rates (100 milliseconds and up). Priority levels 0 through 128 scheduled before all standard Windows priorities. Strictly priority based, not time-sliced. Processes run to completion before relinquishing CPU. True deterministic real-time process scheduling under Windows. All process types use the same library of application functions. System and application software built using Visual C/C++ and Visual Basic .NET. All software developed using Microsoft Visual Studio .NET tools. All processes can be developed (code, edit, debug…) as standard Win32 processes on any PC with access to Microsoft Visual Studio .NET. Any process can be changed from one type (Win32 Normal, Win32 Real-Time, or RTSS Real-Time) to another with a simple re-build. C++ classes are supplied to support many process control functions. Complete facilities for developing custom applications are available to the end user. These libraries are described in detail in the "Task Development Libraries" section of the on-line Tsentry documentation at http://www.tsentry.com. The Process Management Class contains functions for starting and stopping processes, connecting processes to resume timers, priority selection, etc. Attach a process to a Process Management Class object. Detach a process from its Process Management Class object. Initialize a process using default parameters read from the initialization file. The next timer interval has expired. Activation of the process is requested. Return the number of currently running processes. Open a handle to allow for fast resumes of another process. Get the application name of a process. Get the binary file name of a process. Get the current percent utilization interval for a process. Get the maximum percent utilization interval for a process. Get the debug level for a process. Get the process group identifier for a process. Get the process ID for a process. Get the auto-restart flag state for a process. Get the repetition rate for a process (ms). Get the run mode (Win32, RTSS) for a process. Get the current state of a process. Get the current state of the Tsentry process manager. Get the start order for a process. Get the amount of time a process has been in its current state (100 ns increments). Get the amount of time a process has been in its current state (1 second increments). Get a description of the specified state. Get a description of the current state of a process. Get the entire process definition for a process. Get the display status string for a process. Set the debug level for a process. Set the auto-restart flag state for a process. Set the current state of a process. Set the display status string for a process. Clear the error state for a process. Return the current time (seconds since 1/1/1970 12:00 am UTC). Return the current time (seconds and milliseconds since 1/1/1970 12:00 am UTC). Return the current local time. Set the watchdog flag for a process. The Global Shared Memory Management Class contains functions for mapping and accessing the contents of shared memory segments within a Tsentry process. For most situations, the data dictionary provides higher-level functions to manage the use of all global memory segments. For cases where more specialized functionality is required, direct access to functions in this class is provided. Create and/or map a shared memory segment. Attach a shared segment to a shared memory management object. Destroy a shared memory management object. Get the virtual address of the shared memory segment at a given byte offset. Get the current status of a shared memory segment. Get the most recent error for a shared memory segment. Get the name of a shared memory segment. Map a shared memory segment into the current process under the specified name. Zero an entire shared memory segment. Write a binary copy of a shared memory segment to a disk file. Read a binary copy of a shared memory segment from a disk file. The Data Dictionary Class allows variables in global shared memory to be referenced by their string names. Start the data dictionary for a process. Shut down the data dictionary for a process. Parse the true variable name from an augmented name. Return a pointer to a variable, and its size, type, and offset. Return the size of a variable. Return a VARIANT object containing the current value of a variable, and parameters for updating the variant. Write the value of a variant back to memory. Get the string description of the data type for a variable. Get the GSM Mask bit mask for a variable. Get the initial value for a variable. Get the minimum value for a variable. Get the maximum value for a variable. Get the formatting string for a variable. Get the description for a variable. Get the initial value for a variable as a formatted string. Get the minimum value for a variable as a formatted string. Get the maximum value for a variable as a formatted string. Set the initial value for a variable. Set the minimum value for a variable. Set the maximum value for a variable. Set the formatting string for a variable. Set the description for a variable. Set the current value for a variable. Get structure information for a variable. Get the name of each item in the data dictionary. Search the data dictionary for a string and return the name of the first variable containing the string. Return a pointer to the Global Shared Memory Management object associated with a global shared memory name. Map or create global shared memory region. Attach an existing Global Shared Memory Management object into the data dictionary. Map all global shared memory regions into a process. Restore a global shared memory region from a disk file. Restore a variable by name from a disk file. Restore all variables in a file by name. Restore variables listed in one file from a second data file. Save a global shared memory region to a disk file. Save a variable by name to a disk file. Save all variables in a file by name. Save variables listed in one file to a second data file. The Message Logging / Error Reporting Class provides a mechanism for processes to post text messages to global queues for later processing or asynchronous display. The available logging queues are defined at system startup time through a setup file. The system provides a default queue named "LogMsg" to which any process may post messages. Messages sent to the default queue are also displayed on the Tsentry system console. While only a finite number of messages are kept in memory, Tsentry automatically writes messages posted to the logging queues to disk files. Post a message to a queue if the message level is less than the debug level for a process. Return the index of the last logged message in a queue. Log the contents of a memory area in hex and ASCII formats. The INI File Support Class provides basic functions for working with .ini files. These include opening a file, finding a section in a file (denoted "[SectionName]"), retrieving lines from a file, and closing a file when finished. Find a section (denoted "[SectionName]") within a file. Get the count of lines in a section. Get the next valid line from a file. Get the value associated with a specified key within a section. Get the value associated with a specified key within a section and translate any environment variables in the value. Set the value associated with a section/key in a file. Clean all lines of data from a section. Delete an entire section from a file. Delete the specified key from a section. Commit any changes back to disk. Get error/return status for an operation. Return a pointer to a file buffer. Get the size of a file in bytes. Get a string from a line. The Timer Support Class provides basic timer functions. These functions can be called by any application process to set and test timers. The timer values are allocated and maintained in user-defined variables and are tested by user calls. Set a timer to expire in a specified number of microseconds. Set a timer to expire in a specified number of milliseconds. Set a timer to expire in a specified number of seconds. Test the current status of a timer. The Utility Functions Class provides basic support and utility functions. These functions may be called by Win32 and/or RTSS application processes. Drive the output LEDs of a test module connected to the system parallel port. Transform a string by translating any system environment variable strings it contains. Delete all files in a directory older than a specified time. Process I/O Device Driver Classes are available to enable the Tsentry system to communicate with several common devices. Both Win32 and RTSS versions of most of the drivers are available. Additional detail regarding the Process I/O Driver Classes is provided in the on-line Tsentry documentation at http://www.tsentry.com. The Rules Processing System provides a process engineer with an easy way to implement automated decision making on a process control system without requiring the engineer to write C/C++ code. It allows the engineer to create a set of Operational Rules that are applied to the control system. An Operational Rule is the combination of a set of criteria with a set of actions to be performed when those criteria are met. For instance, an Operational Rule may specify that the resistance target of a given smelting pot should be altered when that pot reaches a specific age. The Operational Rules System consists of a supervisory process that manages each of the operational rules, tests the criteria to determine if the rule is satisfied, and takes appropriate actions. A single control system may have any number of rules defined, each of which is independently evaluated by the rules manager process. In addition, the Rules Processing System provides a user interface to allow the engineer to create, modify, load and view the status of Operational Rules on the control system.